“But other factors, such as how candidates work under pressure, are increasingly being considered in the hiring process” (Hiring: Grades Matter but Other Factors Vital, Jolene Ang). The eagerness of employers to justifiably reduce the disproportionate reliance on grades for their hiring practices overlooks the important point that there is also no perfect, bias-free indicator for this purpose. Yet instead of adding more application requirements or subjecting job applicants to a battery of tests and assessments – which likewise have their own deficiencies and which are likely to overwhelm applicants in an increasingly competitive job market – improvements should focus on a more holistic evaluation, not in the antiquated sense of making the process more onerous or piling on factors in a never-ending list of employee expectations, but in terms of accounting for the backgrounds and trajectories of applicants, to consequently reduce bias. In this vein, instead of the cited challenge “to hire up to 10 per cent of employees ‘blind to resumes and grades’, but instead choose them based on their traits” (ST, Jan. 31), employers could be encouraged to be more cognisant of how demographic traits – such as gender, race, educational background, schools, as well as other socio-economic variables – could bias their decisions. Furthermore, the imprecision of what is meant by “character traits” only obfuscates the application process, and is also likely to benefit students and young applicants from more privileged households. It is no surprise, therefore, that successful applicants or employees of comparatively disadvantaged circumstances appear to as exceptions, rather than the norm. Their counterparts, on the other hand, are able to “game the system”: Getting tips or extra training for psychometric profiling assessments or group interviews; paying professional companies to draft cover letters or application documents so as to stand out; as well as having more time and bandwidth to engage in a variety of co-curricular projects or community activities, so as to enhance one’s CV. And as changes happen in the workplace – with employers becoming more explicit with the desired traits and designing hiring practices to minimise the influence of bias – changes ought to follow in the classroom too. Education Minister Ong Ye Kung posed the question: “If everyone thinks like that, why is it that in society, among students, they feel like grades are still so important?” In addition to the ongoing improvements to education and career guidance in schools, grades are still an important determinant: For school and pathway selection, for access to enrichment programmes and services, and ultimately for advancement to the (local) universities. 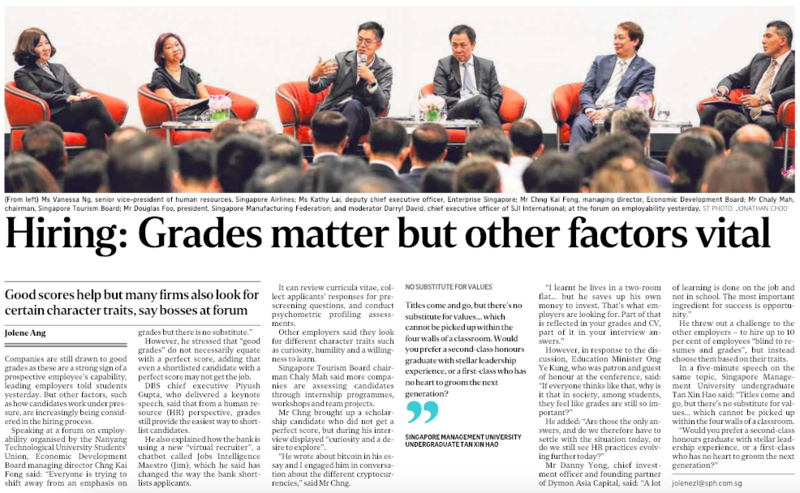 Any move away from the obsession with grades is hence contingent on broadening and accepting different notions of “success”, and like the aforementioned proposals for employers, schools and their teachers will have to follow through holistically too.